There you have it, the much anticipated Pantone Color of the Year was announced as Radiant Orchid. The color is a pinkish purple, somewhere between a pastel and bright tone. Designers of all fields, trendwatchers and creative media have and are influenced by this announcement. Is it truly that important? Consider this, business leaders who otherwise have no opinion on color or design have been known to pull their investment from a brand for their lack of the color in their upcoming collections, thinking they are no longer relevant. Ouch. 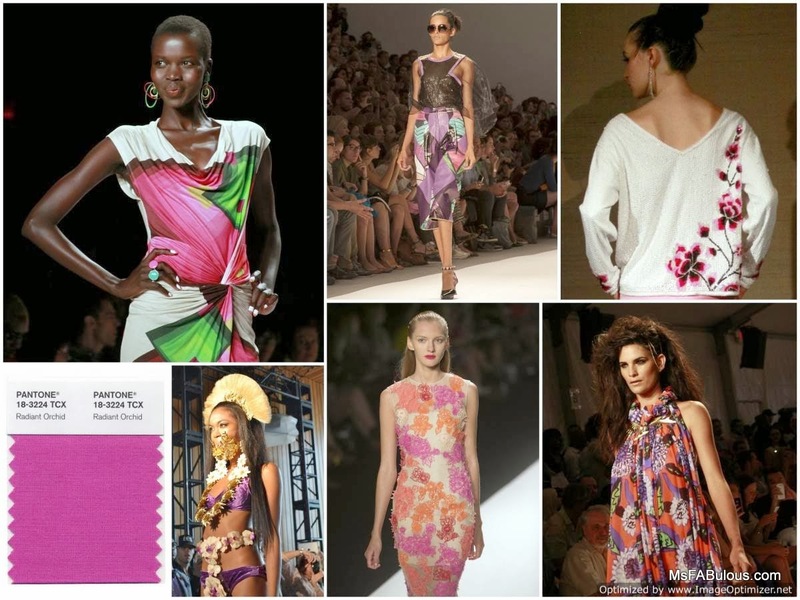 Besides the purple/pink color as the hue of 2014, the "orchid" part of the equation is also key. When scrolling through my photo albums of New York Fashion Week, I found that designers who made this color a key component of their collections also incorporated it into bold patterns resembling tropical florals. Desigual had huge over-sized painterly blossoms (clockwise from top left). Custo Barcelona used the color ethnic, geometric prints. Theia embroidered big blooms in sequins. Dolores Cortes used it as an accent on a retro styled print. Monique Lhuillier appliqued flowers in the orchid color onto elegant dresses. Mordekai had the most literal interpretation, with a model in a purple bikini wrapped in orchids.